Also check out our wedding video collection. When I decided to get married in Las Vegas, I was very nervous about picking the right vendors. I had nothing to go on except internet reviews! I narrowed the company I wanted to use down to two, and emailed them both, and got the best response from Las Vegas Strip Weddings. I chose them and am so glad that I did!!! 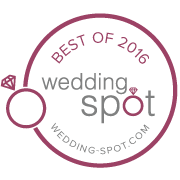 Michelle at lasvegasstripweddings.com was so helpful not only with planning the ceremony in the Valley of Fire and answering all my questions, but with recommending other vendors as well. She recommended someone to do my hair/makeup, set up a tux rental for us, and booked us the larger limo that we needed/wanted… all of that was above and beyond the wedding package that we paid them for. She also booked a male officiant for us as my parents are old-fashioned and uncomfortable with a female. Everything she set up for us was PHENOMENAL. All of our vendors were on time and super professional. The ceremony was beautiful and I couldn’t have asked for anything better. I was mostly concerned with having a nice ceremony and gorgeous pictures. I don’t have the pictures back from the photographer yet… she said that she would edit them and send them 7-10 days after the wedding, but she was so nice and if her pictures are as beautiful as my sister’s photos turned out then I will be thrilled. She was willing to take any pictures we wanted and had her own suggestions as well. If you are considering a destination wedding to Las Vegas, I don’t see how you could do any better than Las Vegas Strip Weddings. Whenever I would email or call Michelle with a question she always responded within hours, and I had lots of questions and changed my mind a lot. My wedding was everything I was hoping for and my husband was so happy with everything Michelle set up for us. Thank you Las Vegas Strip Weddings for a magical day!!!! Just wanted to send a quick note to thank you for a wonderful ceremony last weekend. Jefferson and I are thrilled with the way everything turned out….we can’t stop talking about it! The limo, the service, the flowers, the photographer, the weather (did you arrange that??? ), and the beautiful words spoken at our ceremony ~ perfection! Thank you both so much for your care and hard work to provide us with the most perfect of days. We will always be thankful to you! We just wanted to thank you for making our wedding day this past weekend very special! We couldn’t have asked for it to go anymore perfect! We are very excited to see our pictures and plan on recommending you and your company in the future. What can I say you are truly amazing at your job. Thank you so much for organizing our wedding for us. It was perfect. I cannot praise Nicole more highly for the photos that she took for us. She was wonderful with our children, even with Cam calling her a ‘bum bum’ to make him laugh for the photos. We are so pleased with all of the photos that she took, I cannot wait to have an album made and some of them put onto big canvases around the house. The minister was fantastic, as was the location at the fountains, and the limo will be talked about for a long time to come. All in all it was superb. I cannot thank you enough for helping our family to create such special memories. Thank you so much for everything! The pictures are amazing! we had a fabulous time getting married again–it was relaxed, fun, and meaningful. The crowds melted away for us, and all I could see was his eyes and all I could hear was your words. We had a blast walking around Vegas dressed to the nines and being congratulated left and right. what a treat! Nicole is a gem. We have a cute selfie with her that we will send you when we can get it off of our little camera. 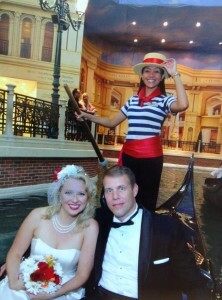 Plus, we have had a blast of a honeymoon all over Las Vegas. The whole trip has been the best sort of fun, and our Vegas strip wedding kicked it all off on the right note. Thank you also, for the kind words you said to me about the way Brian looks at me. That has given me a secret glow all week long. We went straight from you guys to the Gondola at the Venetian. Such fun! Thank you for your excellent service. It was very stress free and went smoothly. I would def recommend to anyone! Tracy and I would like to thank you and your staff for making our wedding a very special one to remember. Our wedding day was more than we expected….over the top! The pictures turned out fabulous and the limo was incredible. I would definitely recommend your business to anyone who asks. Just a quick note to tell you how great everything turned out last night!! It was everything you promised and more. We couldn’t be happier!!! We wanted to say a MASSIVE thank you for all you did in making our wedding perfect for us! We really really appreciate your great communication, which put our worries at rest. Everything ran so smoothly, it was a dream and great fun all at the same time. The limo driver had personal tips and kind words which helped a lot! The Reverand and Ralph guided us through the event and into marriage as well as getting the certificate and pictures to us. Special thanks to the wonderful photographer whose pictures got many oohs and aahs from family and friends. Everything was planned and done with such efficiency! We would highly recommend you to anyone! We would just like to thank you for the wonderful wedding we had on Friday under the Las Vegas Welcome Sign. Everyone from the limo driver, officiate, photographer and to those who coordinated the wedding proved us with a wonderful time. It is great to work with people who understand customer service especially on such an important day. It is always a bit unnerving to try to set a wedding across country but you people made sure everything was great. We look forward to receiving the wedding photos. Just wanted to send everyone a quick thank you. The photos were amazing and things just ran perfectly on the day. Paulie and I were so pleased. I will be contacting you again for the renewals! I just wanted to thank you for everything you did for me through the planning all the way to the end of our hummer ride! It was beautiful and perfect! We all had a great time, and I greatly appreciate the small details – especially the chair for my dad! I couldn’t have asked for a more perfect wedding day! Thank you so much! Here is the link to our online wedding album! I’ll be sure to credit ya’ll and if I can leave positive feedback on any of your websites, please let me know! You all are wonderful! We just wanted to thank you for the beautiful wedding ceremony that you helped us with. Everything turned out great! Time went by so fast but Elizabeth made me (Missy) feel so comfortable and you took good care of us. I really will recommend your services to others as well. We were very pleased with everything. Thank you as well for sending our photos. The photographer did great! Even though we did not get the HD video, the pictures he took of us captured the most perfect moments and we will cherish them forever. Thank you Elizabeth for your kind words in the ceremony. We took each and every word to heart and meant every word as we repeated them after you. Send thank you-s to your husband! He was very kind and courteous to us. The limo driver! Was awesome! He guided us to our destinations in the best way he could and was very courteous as well. If we could we would do it again soon. Just to re-live that special day. When we decide to renew our vows, we will definintely call you up and see if you will be available at that time. Again, thank you so much for everything. We are very, very happy. I couldn’t have chosen a better service than Las Vegas Strip Weddings. Thank you for your genuine concern and attention to helping us get our Marriage Certificate corrected. I have spoken with the Marriage Bureau, who claim that, as they are not a policing agency, it is up to the to-be-weds to ensure the correct and official country of residence information is on the form. Of course, they are quite right, as we are adults, and I suggested they make the address section on the license app form clearer that it should be Permanent Residence Address and not simply a postal address (which naively we must have thought it was). They are getting back to me with regards to how I can get the amendment processed and I will duly let you know of the progress, incase there is anything needed for your records. Thank you again for your kind care and attention. First let me say ……. Thank you so very much for the wonderful job you did with our wedding! It was perfect in every way! If someone were to ask if I would have changed going to Vegas to get married and having you handle the wedding, without hesitation I would tell them NEVER!!! You made our night a very special one, and I wouldnt have changed a single thing! We will be back April 20th of 2013….maybe we will pop in to say “hello”! Keep up the good work and doing what you do best…..Making beautiful memories for all those happy couples!! I wanted to give an extra special thank you to Michelle for taking the time to make me feel very important, and reassuring my every last fear! You are awesome. The photographer was AMAZING, and we look forward to seeing our photos soon. Kenny, the limo driver, HILARIOUS!! Thank you for the laughs and really taking time to make our day truly amazing…Reverand Elizabeth, thank you from the bottom of our hearts…You were wonderful. 🙂 I will highly recommend your company/services to everyone I know. Words can’t express just how happy we are with the way our BEAUTIFUL wedding turned out…None of it would’ve been possible without you!! the way that we were treated like family to make sure our day was special. I wanted to thank you for an amazing day. You really came through for us. Our wedding was perfect! Thank you so very much. I promise, when we renew our vows we are calling you!! Everyone, and I mean everyone made our important day so very special. Even having our first kiss broadcast on the local news to having our picture in the local paper. WOW! Even loved our limo driver. I feel I cannot thank you enough. Much appreciation & sincere thanks for a wonderful job by such wonderful people! Hi Michelle! I just wanted to take a minute to tell you thank you for all of your help, our wedding was great, the lakeside garden location was beautiful, and Reverend Elizabeth was wonderful. Everyone has commented on how gorgeous the pictures are and we’ve gotten quite a few “I wish we would have done that” comments from our already married friends! Thank you again so much for all of your help and patience with all of my questions and my changing the location. PS: we were both very excited about seeing our pictures on your web site as well! We’d like to thank Las Vegas Strip Weddings for the fabulous wedding arrangements! They covered everything including the limo, photographer,flowers and Reverend Liz. We’d like to thank Michelle for answering all our questions and recommending a great salon. 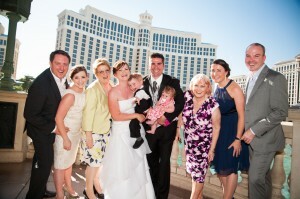 Las Vegas Strip Weddings truly made this a most enjoyable stress free wedding! We will definitely plan to renew our vows with them in the future !! Looked after and made to feel very special. Our chosen wedding location was the las Vegas sign which made for some great photos. Rev Elizabeths service was really moving and perfect for us. Thank you for making it such a special day. After a bit of a saga with the DHL we have finally received the certificate, thank you for sending it so quickly. We would like to thank you both for a wonderful ceremony we had at the Sign. Everything, from the first point of contact, to the moment we got our Marriage Certificate signed, went very smoothly. We did not give much of a notice so everything had to been done quickly and we were very satisfied with our pre-wedding communication with Michelle, which was prompt and informative. Although the Sign may be a bit noisy with all the traffic and other couples, but Liz has made us feel like the only people in the world, which was indeed very special and exactly how we wanted. We cordially thank Liz for the words she chose for the ceremony and her warm and kind attitude. Ray and I are so thankful for everything you did to make our weddng stress free. When our flight was delayed in Atlanta, you assured us that we wold still have time to get our wedding done on the day we wanted…..and you made that happen for us. We really didnt think we were going to make it but you made it happen for us. Thank you so much. Aj and I wanted to Thank you guys very much for our wonderful wedding. We felt like you guys put your heart into making sure we had a wonderful perfect wedding and we did. Our limo driver and photographer were amazing. Our pictures turned out amazing and our limo driver was funny and friendly and took us everywhere we kept his card we will be using him again when you come to visit. We recommend if your getting married get married with Las Vegas strip weddings!!!!! I will be telling everyone about you guys!!! “I am SO HAPPY with everything. It was such a beautiful wedding. You, Liz and Gustafo were great, and made us feel so much at home. The service was amazing and the pictures are unbeleivable. This was such a heart warming experience for both Jay and I, and I have to say that we couldnt have dreamed of a better way to get married. It truely was the PERFECT wedding. Thank You for all you did to make our day so perfect, smooth, and flawless. We really appreciate all that you did. I just wanted to take a moment and thank you for making our special day so perfect!!!! I tell everyone this is the way to get married. You guys where so wonderful in having everything ready and organized so that our marriage could be about us and worry free. I absoultly love our pictures and have gotten so many compliments. We look forward to renewing our vows with you often!!! The ceremony was perfect in every way!! Thank you again. We just wanted to thank you from the bottom of our hearts for all your assistance and services. It was a beautiful, magical experience and we still can’t believe how perfect everything was that day. Reverend Elizabeth, our day would’ve not been the day it was had it not been for you and your entire team. What an amazing group of people we had. I cannot express how much it means to Michael and I that we had you to bless us with your love, support and kindness. Your energy and warmth will never be forgotten and we-to this day, tell our families about you. If possible, we would love if you could pass on an extra Thank You to the rest of the team. Our videographer, Jaime, The Sweet and Kind Gentleman who brought the cake (We’re so sorry we forgot his name, was it Randi? ), and Eric who was such a fantastic, friendly and extremely patient driver.